The Rev. Kenneth McKoy, shown here at a 2015 vigil against gun violence, is among those skeptical of how the Trump administration's budget will help St. Louis fight crime. President Donald Trump and members of his Cabinet repeatedly have promised to help get violent crime in cities like St. Louis, which is on pace to have 180-plus homicides for the third year in a row, under control. The administration has promised an additional $200 million to combat the problem, with most of the money targeted to boosting enforcement. Though St. Louis is guaranteed none of that money, the budget is praised by local law enforcement and criticized by those who daily try to fight crime on the ground. 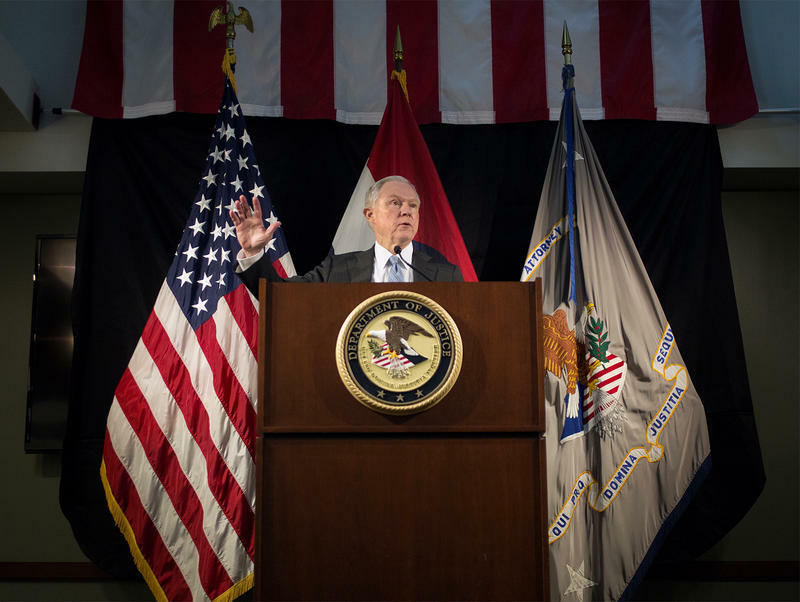 When the federal government announced last month that the Department of Justice would give a dozen cities expert advice on fighting crime, St. Louis was not on the list, infuriating local politicians. Rachel Lippmann asks what the proposed Department of Justice budget could mean for fighting crime in St. Louis. But St. Louis began receiving help in 2016 from that program, known as the National Public Safety Partnership. Participating cities don’t get any additional money, but do get help with things like research, training, and developing anti-crime strategies. 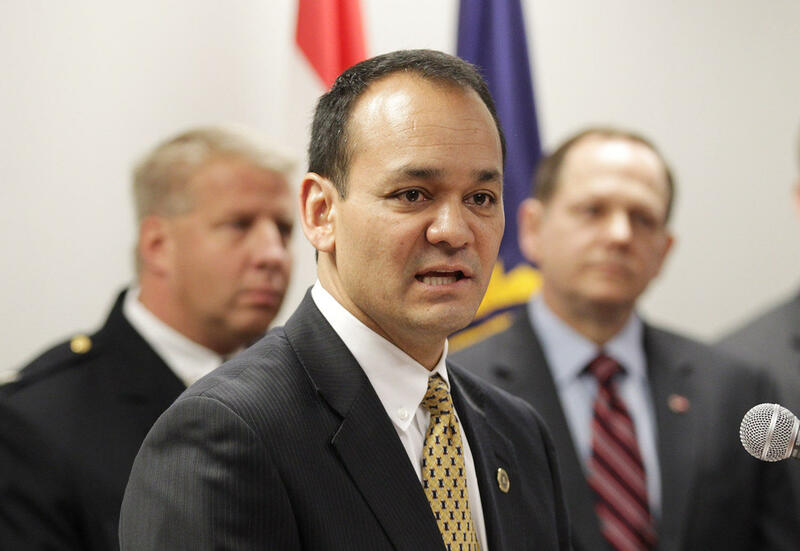 William Woods, the special agent in charge of the St. Louis office of the FBI, says the proposed budget from President Trump will deepen already-strong relationships between local and federal law enforcement in St. Louis. He's pictured here in a 2015 file photo. Expert advice is one of the ways the federal government helps out local law enforcement. It also gives grants to help departments pay for equipment like cameras or to hire more officers. But enforcement is the biggest focus of Trump’s proposed budget. He wants to hire 230 more prosecutors and give more money to the FBI, the Drug Enforcement Administration, the Bureau of Alcohol, Tobacco, Firearms and Explosives and U.S Marshals Service. “Any time we can get additional resources, that’s going to help” make this area as safe as we can, Woods said. The Rev. Ken McKoy doesn’t hear safety concerns in Trump’s rhetoric. For the past two years, McKoy, the pastor at Progressive AME Zion Church, has led a street ministry he calls NightLIFE. Three or four times a week, he and other pastors walk the streets of the Academy, JeffVanderLou and Fountain Park neighborhoods, handing out food and water. On a recent Saturday night, fireworks exploded overhead as McKoy led three other pastors down Aubert Avenue in Fountain Park. Almost every other lot is vacant, leading a pastor from Kansas City to remark that he felt a heaviness as soon as he stepped onto the block. McKoy has built up trust in the neighborhoods. People approached him, knowing he had sandwiches and apples. One young man asked McKoy to pray for him; McKoy did without hesitation. “We pray God, in the name of Jesus, that no one within the sound of my voice will fall victim to gun violence, will be incarcerated, or anything else, God, that is contrary to your intentions for us,” McKoy said over muttered “Amens” and the pop of fireworks. McKoy said he sees nothing in Trump’s budget that will help the people he prays with on those walks. Many of them are struggling with addiction, he said, and already-limited treatment options could be slashed even further if the Affordable Care Act is repealed. Jay Kanzler, an attorney and Episcopal priest, said walking with McKoy over the last year and a half had shifted his thinking on what communities need. “By giving people education opportunities, giving people job opportunities, giving people treatment opportunities, then you’d see something happening with the crime problem,” he said. The Rev. 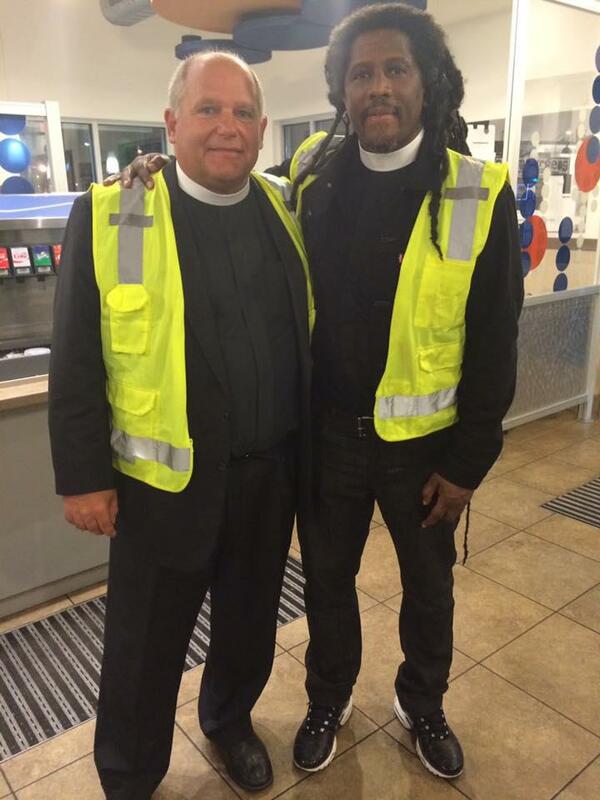 Kenneth McKoy (right) and Jay Kanzler (left) after a recent NightLIFE walk. 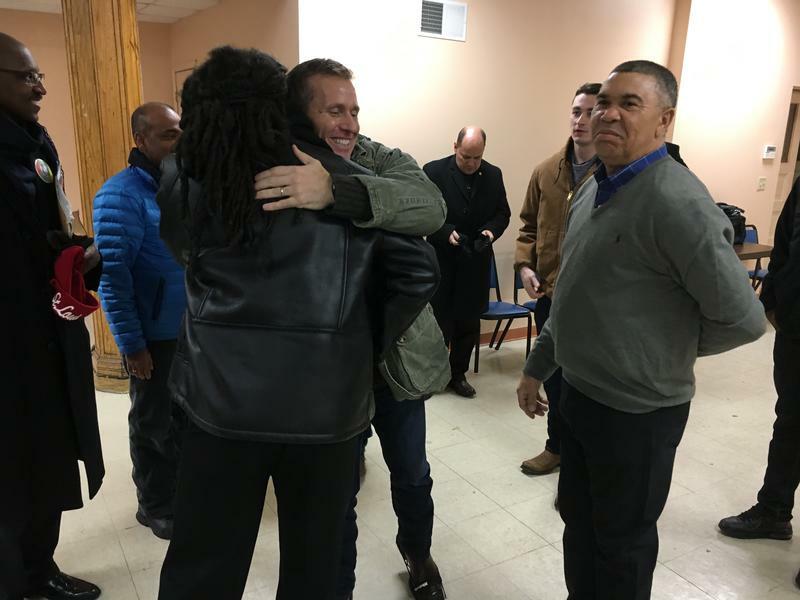 Woods doesn’t dispute the need for social services, but noted that the federal government already helps St. Louis in that area through the “Promise Zone,” a 10-year program that funnels millions of federal dollars into community agencies working on things like education and re-entry. It includes some of the neighborhoods McKoy ministers to. Trump’s focus on enforcement is “altogether appropriate,” said Rick Rosenfeld, a Founders Professor of criminology at the University of Missouri-St. Louis. While the president wrongly argues that the U.S. murder rate is at an all-time high, Rosenfeld said, St. Louis and other cities did see a spike. Homicides in St. Louis went up 32 percent between 2013 and 2014, and 18 percent between 2014 and 2015. But, Rosenfeld said, enforcement “can’t be to the exclusion of additional resources to other programs.” Other researchers who have evaluated the DOJ budget closely say that’s exactly what the Trump administration has proposed. Trump plans to pay for the agents and prosecutors at the expense of $300 million worth of grants for crime prevention efforts like prisoner reentry and youth mentoring, according to Thomas Abt, a senior fellow at the Harvard Kennedy School of Government who worked in the Justice Department under President Barack Obama. The criticism of Trump’s heavy focus on enforcement is also coming from more traditional Republican circles like the Cato Institute, a libertarian-leaning think tank. Mayor Lyda Krewson said Friday that she’s “beside herself” over a rash of gun violence in St Louis this week that killed seven and injured 13 others, including a 7-year-old girl. 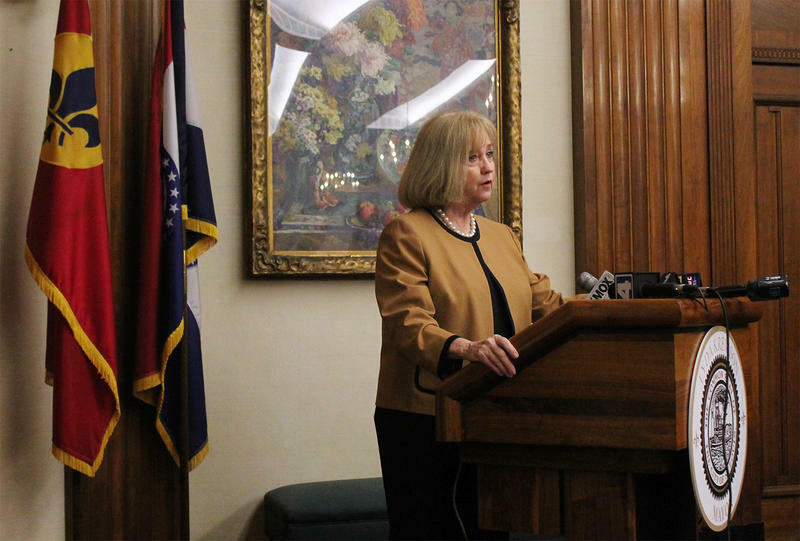 But even as she pledged more money for police officer salaries, Krewson seemed at a loss for how to bring the spiraling violence under control. Three nights a week, between the hours of 10 p.m. and 2 a.m., half a dozen St. Louis clergy members walk the streets in a line. Led by Rev. Ken McKoy of the Progressive A.M.E Zion Church, they visit the Fountain Park and Lewis Place neighborhoods to act as a “ministry of presence,” as McKoy calls it. It’s a violence prevention effort that began on a grassroots level and is now on the cusp of expanding. McKoy calls it NightLIFE.